The 30th Oshawa Group is leading the way with Group growth and they are achieving this with Youth-led programming and by simply, having fun! Since last year, their Group’s numbers have increased by 40% and a lot of this growth has to do with focusing on each individual youth. ScoutScene chatted with Group Commissioner Louise Libby and Scouter Suzie Noorland to find out how they make their program so much fun and why the kids are coming back each year. Louise Libby and Scouter Suzie both believe their Group was on the Canadian Path long before it started. “Youth-leadership plays a large role in our youth numbers and membership. We were doing this [Youth-led] long before the Path came into play and the kids really respond to it.” From making decisions about how many camps they will do, to board night games and laser tag, the 30th Oshawa Scouting youth are the ones leading the way, with the help of their trusted Scouters. For our Group it’s about allowing each youth to have a say. We run a child-focused program and we ask each individual kid what they would like to do or see happen within the program. This allows us to know when something is a good fit for the Section or Group. Youth-led is not the only influencing factor that helped increase the 30th Oshawa numbers. 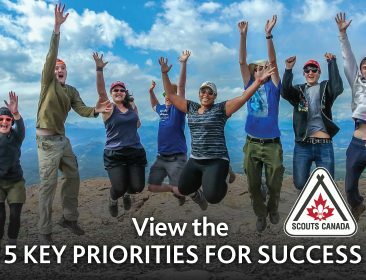 Scouter Suzie believes that their involvement in the community impacts their numbers and showcases the positive experiences youth are having in Scouting. “Kids are their own best promoters for the program,” claims Suzie. “The Group participates in the annual shoreline cleanup, Santa Clause parade and they volunteer at old age homes. The Cubs right now are going to the hospital to hand out Christmas cards.” The 30th Oshawa Group focuses on being active in the community and this community participation helps their membership numbers and gets them noticed in their area. Another way the Group attracts Scouting youth is through Bring a Friend events. These events are a huge success for the 30th Oshawa Group, and they always make sure to have fun activities for the youth to do. “Our Beavers always have a drive-in movie night for Bring a Friend. We get the youth to create cars out of large boxes and then they watch the movie in their cars. It’s always a lot of fun and we always get new youth members from it.” Bring a Friend activities are not just for Beavers though, even Scout and Venturer aged youth can bring friends with them. According to Scouter Suzie, the Venturer Company is filled with members that resulted from Bring a Friend activities.